The Complete Golf Handicapper for Windows was developed as an independent study project at the University of Arizona in 1991. It was my last semester in Computer Science, and I needed 1 more unit to complete my degree. At the time in an academic setting, Windows was a very unknown, mysterious, and dismissed Operating System. I knew that Microsoft was on to something with Windows, and I knew it would be popular, so I taught myself how to develop for Windows with Charles Petzold‘s seminal book Programming Windows as my bible. I hard-pitched my Computer Science Professor, Robert Drabek the idea of a native Windows GUI program where you could enter in your actual per-hole golf scores, compare them to the course certified par, and it would compute your handicap for that round, and keep history for all your rounds. It took some convincing – he wanted me to do it in Unix/X11, but I eventually talked him into letting me write it for Windows 3.0. The only language back then to write Windows programs in was C. I used Microsoft’s C 6.0 Compiler, which was like $600, so I “borrowed” a copy from a friend and coded away. 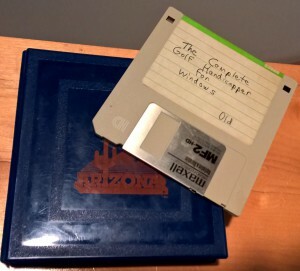 I found this 3.5″ floppy disk in my garage the other day and thought it would be fun to see it, so I ordered a USB Floppy Drive from Amazon, and much to my pleasant surprise – 24 years later, the disk was still readable, and the code all there. I post it to Github for historical significance under the “public domain” spirit, being how old it is. It’s interesting to look at how low-level I had to write to get the simplest things done. Programming Languages and Application Frameworks have come a long way since 1991!